sleepyjeremy: Equipment Hangat Untuk Anda !!! Entry ni originally posted kat blog Dull Entertainment Programme (klik). This is one real beauty. Jadi mana-mana yang berminat kena bertindak cepatlah.. hehehe.. I'm actually sad to announce this but as a return favor to my good friend, I'm putting this ad on his behalf. DEP has been using this bass guitar, numerous times for our shows and it’s hard to be parted from such a fine instrument. It's a classic Fender P-Bass (70's) however some reworks took place more than a decade ago which had minimised it's original features. 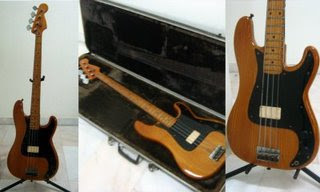 But do not fret just yet, since the tone quality(solid body) and handling is very much - excellent! 1) Body and neck/headstock - Re-treated to ensure that it won't be munched by termites, hence the missing logo on the headstock. Sincerely, this is one of a kind bass guitar. Imagine Flea, Steve Harris and that bassist from The Wailers in that 'Stir It Up' video. I won't put Sting here as he's sporting a completely different P-Bass. I mean, it's existence can only be associated with cool bassists or cool bass playing. For collectors out there, this is not just an old P-Bass but has a history of it's own. The price is RM2K and the good news is that, price is negotiable. (Too bad, I still can't afford it :(). It also comes with a hard case (Fender of course! ).